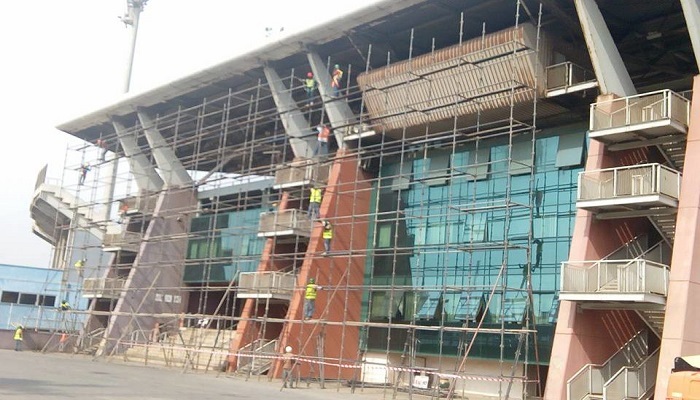 The contractor working on the Accra Sports Stadium say work is 90 per cent complete, promising to finish the renovation project on time to host the 2019 Africa Women’s Championship next month. The facility, which was fast deteriorating, has been shut down for about six months now to allow for it to be put it in shape for the 2019 Africa Women’s Championship. While a lot of the talk has centered on the readiness of the facilities, officials in charge of the renovation insist everything will be fine. Officials say they have spent 12.5 million cedis on the renovation of the stadium. Coupbay Ghana which has been working on the project say the structure will be ready to host the opening game on November 17th. “For us to finish before the tournament, that is 100% possible,” the project manager in charge of the renovation, Osei Bediako Mohammed, said. “We just started September and we are finishing October so we will finish before the commencement of the game in November. All the structural work is over,” he added. The seating at the Independence Square and Conference Center end of the Stadium is being upgraded. The contractors are re-working on the rusting metals in the stands which many feared could wreck. The VIP stand and media center are all being upgraded with washrooms that were a major source of concern for visitors to the stadium.